Designing the best games you may not have heard of... yet. James Ernest may be the smartest guy in the world. It’s true. He designs the games that keep really smart people up late playing. While most people associate board games with Parker Bros. and card games with Magic: The Gathering, James has been designing games under the Cheapass Games label since the late 1990s. 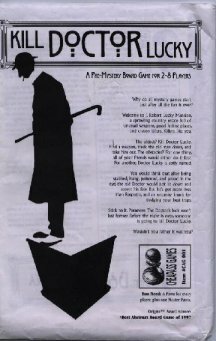 Many of his games, like Kill Dr. Lucky, The Great Brain Robbery, and Diceland, have won Origins Awards, the gaming version of the Oscar. In fact, James has won or shared 9 Origins Awards since 1997. I was lucky enough to get El Cheapo to answer a few of my serious gamer-geek questions. Chris Garcia: You’re the big name in small games. What’s it like being a god? James Ernest: The holiest of my followers flock to me biweekly and smother me with gifts and praise. I walk among the lowly from time to time dispensing my wisdom and patiently observing their unworthy and selfish acts. The sun shines at my command and flocks of nightingales sing me each night to my rest. CG: Alright…I’ve been a big fan since I stumbled across Before I Kill You Mr. Bond. Ya’ll were certainly one of the first companies where you could get games for a reasonable price and since then, there have been dozens of imitators. What do you see happening next in the industry? JE: Next? Man, I wish I knew. Most entrepreneurs are lucky if they can guess correctly once in their lives. I can tell you that right now, game retailers (the small kind) are working on tighter budgets and carrying fewer evergreen products, deciding instead to subsist on “frontlist” games: games that are less than four months old. Their small budgets stem from having loads of backstock they can’t sell and won’t destroy: namely, a zillion d20 products. If one company were (directly) responsible for all this d20 inventory, they might make a deal with retail and take some of it back to ease the problem. But it comes from everywhere, can’t be returned, and takes up space and money that should be used for product that moves. In the short term I hope small retailers feel a surge of returning business from the closing of the Wizards of the Coast chain. If that’s enough to make them healthy again, I’d be thrilled. But it may just be a bump in the road to ruin, as brick-and-mortar stores continue to lose business to online retailers. Few hobby stores have the budget or the sense to provide their customers with a truly meaningful reason to shop there. teck-mologee that can make sitting at your computer comparable to, or easier than, playing with live opponents. If someone could figure out how to take advantage of that they’d be rich. I’m working on it. 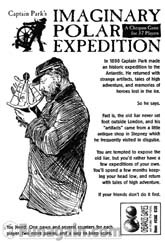 CG: The descriptions for Captain Park’s Imaginary Polar Expedition and U.S. Patent #1 were two of the most creative pieces of fiction I read in 2002. Have you considered writing longer form speculative fiction? JE: I actually like the short form. When I was in college I wrote humor pieces that were about a page long. Any longer, and the joke was old. I never imagined that running out of steam would become an essential skill. I do have some longer stories kicking around, including a couple of screenplays, a collection of short stories, and a book about low-stakes poker. The poker book is the ultimate collection of short stories, really; a million little sets of rules for poker games, with one-page insets about strategy and rules. Look for it next year in a discount bin near you. CG: Ah, so how do you feel about the recent Poker Explosion? JE: I think it’s awesome. Poker is a really great game, which has only lived in the shadows because it’s gambling. It’s nice to see poker coming into the spotlight for a couple of reasons, not the least of which is that the popularity of poker tends to load the low-limit casino games with new players. This makes it fun for the rest of us. CG: OK, it has to be asked: what games influenced you to design the games you make? Nowadays, when it’s game night at Casa de Ernest, what games are on the table? JE: I’m really impressed with Puerto Rico; there are parts of it that really bug me, but in general I think it’s a solid game. I got into game design when Magic: The Gathering came out, and I learned a lot about deck construction from playing that game. Not to mention concise rules writing. I’m also a huge fan of poker, a game where the rules are transparent but the strategy is endless. The strategy may be endless in Puerto Rico, but so are the rules. CG: How long into playtesting does it take to see if a game is going to make it? Do you find it harder to balance the elements of luck or the elements of strategy in a game? When in the playtesting period do you know that a game is seriously in need of balancing? Some games are immediately good, some are immediately bad. Some games (these are the worst kind) hang on the cusp of playability for months. Usually I will stick with a game longer if I think the story is compelling. If it’s an abstract game, it either works or it doesn’t, and I move on. But with a game like Captain Park, I like the story so much that I’ll invest a couple of months getting the mechanics right. Sometimes you don’t have a choice, like when the project has a deadline. In those cases, if one mechanic doesn’t work, you have to be willing to quickly scrap it and start over. This is why a lot of designers hate working on schedules. Balancing the luck and balancing the strategy are the same thing: you balance one against the other. Every game calls for a different mix, but the rule of thumb is the longer the game, the less luck should matter. In a game like poker, there’s plenty of short-term luck in one hand, which is fine, but in the long term strategic play will usually win. FALLING can be incredibly luck-driven (okay, bad example, there’s actually strategy and speed in that one) but One False Step for Mankind relies much more on skill. FALLING is a 90-second game and One False Step takes 3 hours: after 3 hours you don’t want to feel like you’ve had no control. There is a separate choice on strategy, which is setting the difficulty level. If we play a game called “pick up the red coin” there’s obviously strategy, but it’s not especially deep. If you go first, you pick up the red coin. (Obviously this would be better as a real-time game.) If we play a game called “Chess” there’s still theoretically an optimal strategy, but calculating it is practically impossible. Both these games have no luck, but the difficulty level is different. For a two-year-old, Pick Up The Red Coin is a marvelous game, and Chess is terrible. The reverse holds true for, say, a grad student. I admit to falling somewhere in between. So it’s important to decide exactly how much thinky-think is appropriate for your players. This is where a lot of beginning designers fall short: they expect their players to be as attuned to their game as they are, and require way too much thinking of them. I know better; I try to write games where, despite the fact that there is strategy, if everyone plays poorly the game is still fun. As far as needing balance, there’s no particular red flag except the obvious ones. If people aren’t enjoying the game, something’s wrong. If one player is rocketing ahead and no one can catch him, something’s wrong. If one of the components bursts into flames, or someone dies, or the game is seized in a police raid, more development may be appropriate. CG: Are there any plans for a Kid Specific Cheapass division producing games for 12 and unders? JE: Not for 12 and unders. However, we are looking at starting a branch of educational games for grades 7 through 12. You’ll hear more about that if we ever get it off the ground. CG: You recently released The Man Between, a thirty minute Spy short starring Anthony J. Gallela. Any plans for future films? Is there a game tie-in coming? If there are plans for future films, do you need a wise-cracking side-kick with curly hair? JE: Hm. Easy questions. Yes, no, and maybe; how much do you weigh? CG: I’m 220, but look two -fifteen. Anyhow, since every game company website has a “We Don’t Look at Submissions EVER!” posted, how does someone break into the business? JE: Well, you start your own company, obviously. Actually, there’s a fantastic book about the hobby game business called The Game Inventor’s Guidebook, by Brian Tinsman (not to be confused with the hilariously outdated Game Inventor’s Handbook by Steve Peek). Brian talks about how to get your game ideas published, or (as a last resort) publish them yourself, and how the game industry works. The secret to breaking into any industry, especially one as small as ours, is meeting people. Work for a game company if you can, not necessarily designing games, but possibly writing articles or reviews, playtesting, helping at conventions, etc. Meet the people who make the decisions and find out what they need and how to get it to them. You don’t really “break” into the industry so much as “blend.” Before you know it, something you do well will become your job. CG: Finally, you’ve conquered the game world. You’ve made strides towards the film world. James Earnest, what’s next? JE: What’s next is convincing people there’s no “a” in “Ernest,” After that I think I’ll prove that black is white and get myself killed either at the next zebra crossing (British edition) or pedestrian crossing (American edition).